View of Glencoe in the Scottish Highlands. 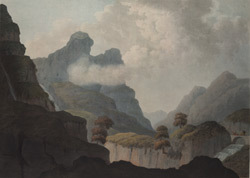 The mountainous landscape of the area made it popular with 18th and 19th century artists. Lord Macaulay, the 19th century historian wrote the following lines after he visited the area, “Glencoe signifies the Glen of Weeping; and in truth, that pass is the most dreary and melancholy of all the Scottish passes- the very Shadow of the Valley of Death. Mists and storms brood over it through the greatest part of the finest summer and; and even on those rare days when the sun is bright, and when there is no cloud in the sky, the impression made by the landscape is sad and awful”.